Last fall one of the members of my bee won a stack of leaf blocks. Our guild has a program where you make a block and turn in it and that gives you a chance to win blocks. Normally there are enough turned in to have two winners. 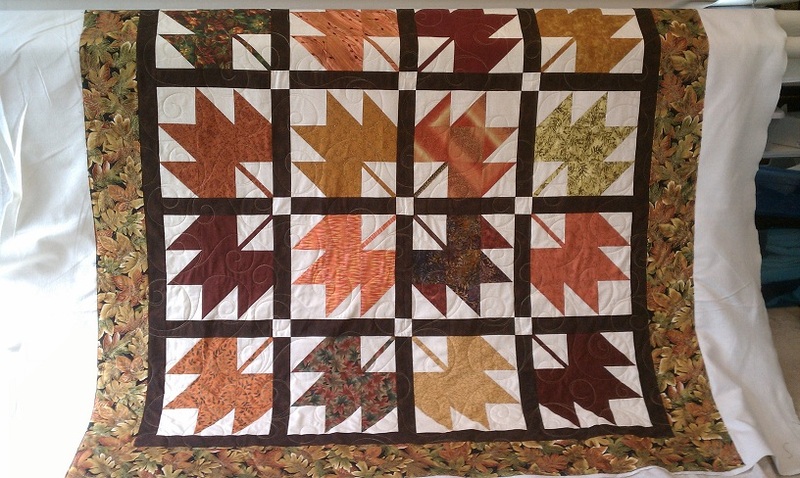 These block became a Bee Challenge this spring we decide to make a quilt an donate it for the Heritage Day Auction. (Which was today.) 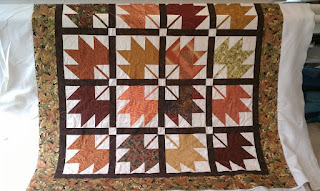 Unfortunately due to several issues the quilt is not finished yet but will be ready for next year. Every member of the Bee has touched this quilt. We all worked on the layout. We all searched out stashes for the perfect border fabric, but none of could find it. Then flipping through a catalog we found the it. We thought the fabric would never make it to North Carolina, but we finally got it. Then the top came to visit my Studio. 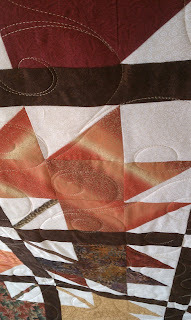 I quilted big airy curls. I love how the gold Glide thread looks. I really like the way the quilting looks like wind. All in all it is a successful quilt. Now we just need to get the binding done so that it can be submitted for next year's auction.